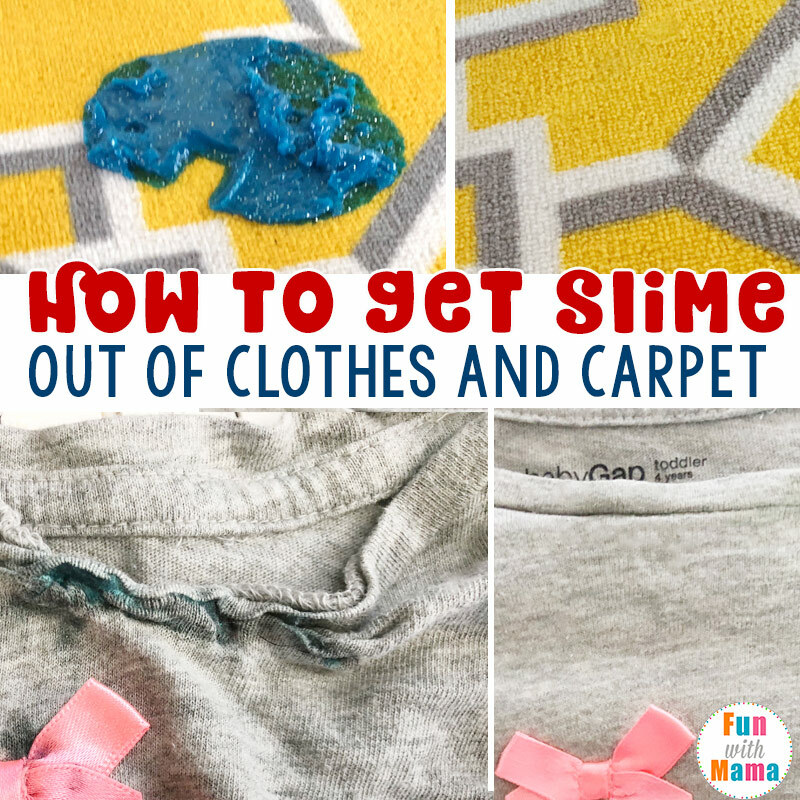 If you are looking for how to get slime out of clothes or carpet then you’ve been making slime and your children have had so much of fun with it that the slime stained your carpet or clothing. The first few times this happened to me, I was incredibly stressed out. 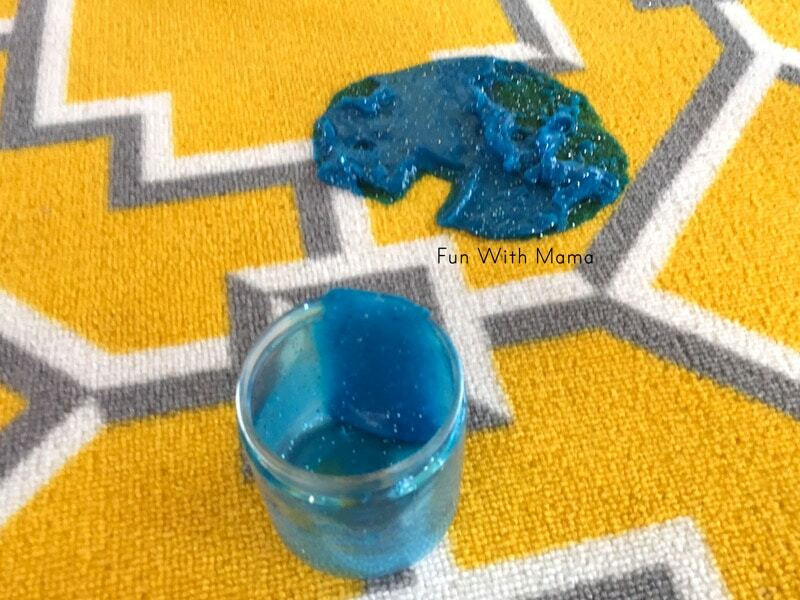 But now that I found out how to get slime out of clothes I am less stressed when the slime gets on the floor or on their clothing. I am normally really responsible with slime. I take my precautions with the kids and purchase fancy slime jars so that we don’t have to deal with slime on the carpet or floor. I have aprons at home to prevent slime on clothes.. but somehow, it still happens. 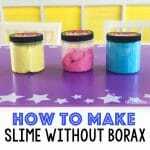 Have you been teaching your children how to make slime? 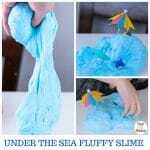 That is often a time where slime spills and splashes happen. 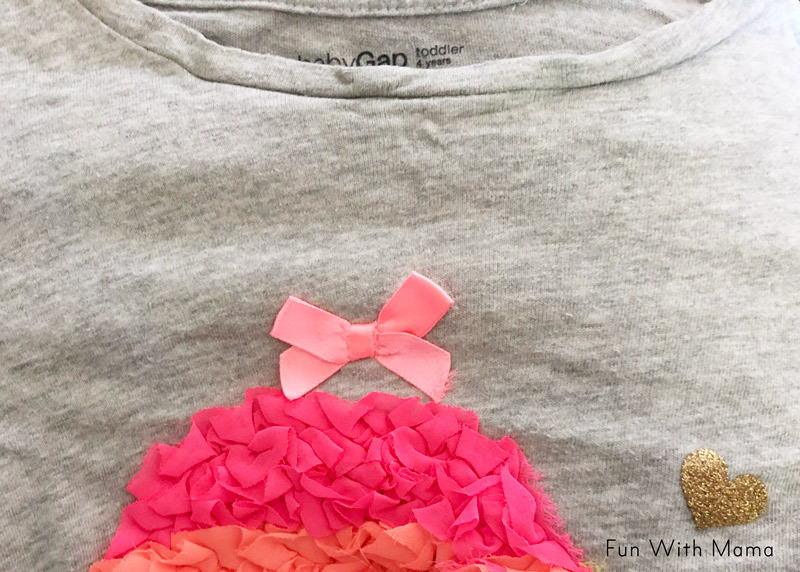 My initial suggestion is to have your children wear an apron of some sort.. but we all know that may not always be easy. 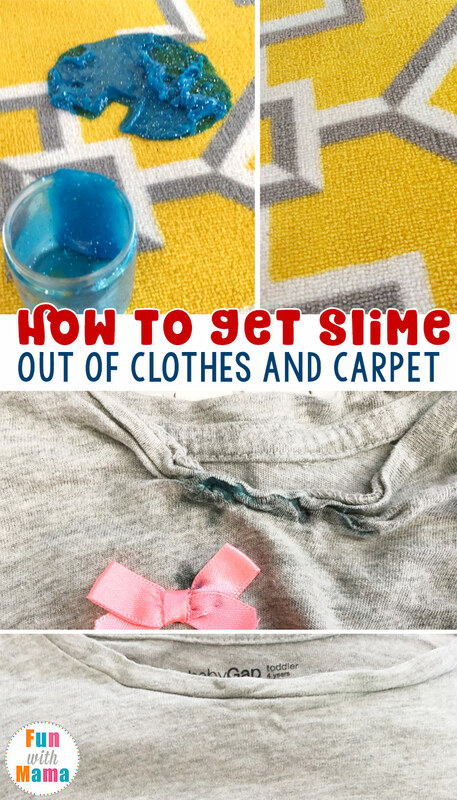 Don’t stress out if you find slime on your carpet or clothes. 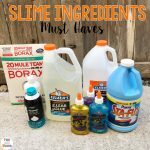 I have a few easy steps to remove slime from clothes and carpet! Step 1: Peel off as much of the slime as you possibly can. As you can see above, there wasn’t much we could peel.. but normally there is excess. Step 2: Use Vinegar and pour it on the slime. This should help it break down and peel off more. Step 3: Use hot water, this should further help remove the stain. Step 4: Wait for it to dry. Look at the shirt below. I woke up one morning and as I come downstairs.. I am greeted by THIS. Panic mode set in. 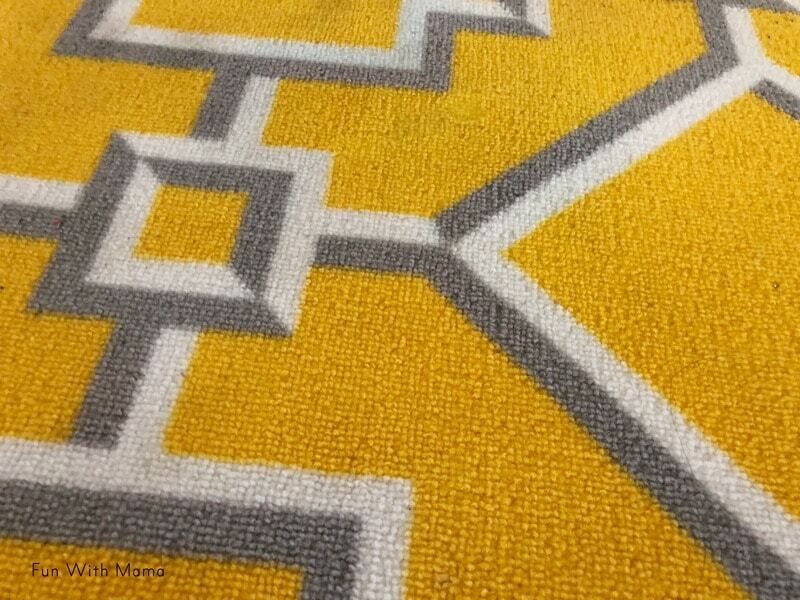 Then I was glad that it was THIS carpet… because their playroom carpet doesn’t have an expensive rug in there. But there was no way this fancy monster of a stain would fit in with our decor. This carpet would have to go if we couldn’t get the stain out. 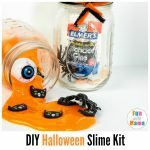 Now on to the tutorial on how to get slime out! Step 1: Peel off the excess slime with a spoon. Step 2: Pour vinegar over it and rub it out with a cloth or rag. Step 3: Pour hot water over it and scrub scrub scrub. 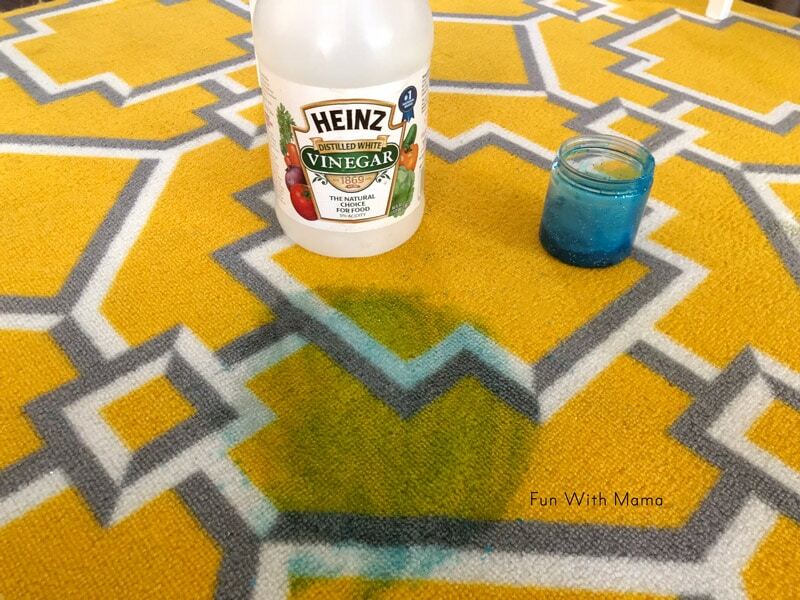 Step 4: Use a carpet stain remover that you have at home. I am honestly very impressed by how much of slime came out of the clothes and carpet. It is as if the stain was never there! 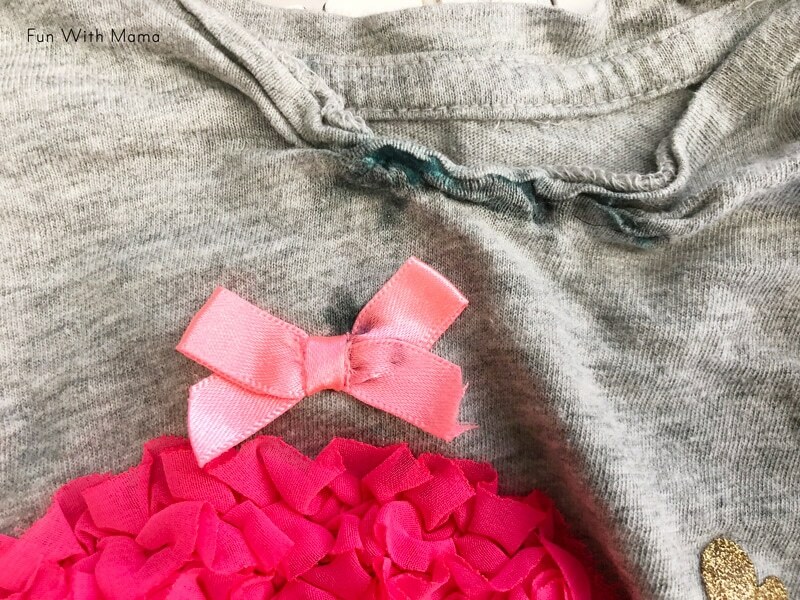 Do you have any other tips on how to get slime out of clothes? Has this happened to you too? What was your initial reaction?